You know what an onion tart looks like. It’s the epitome of French food with those caramelizing onions densely scattered over the top. In the American South, things are a bit different. 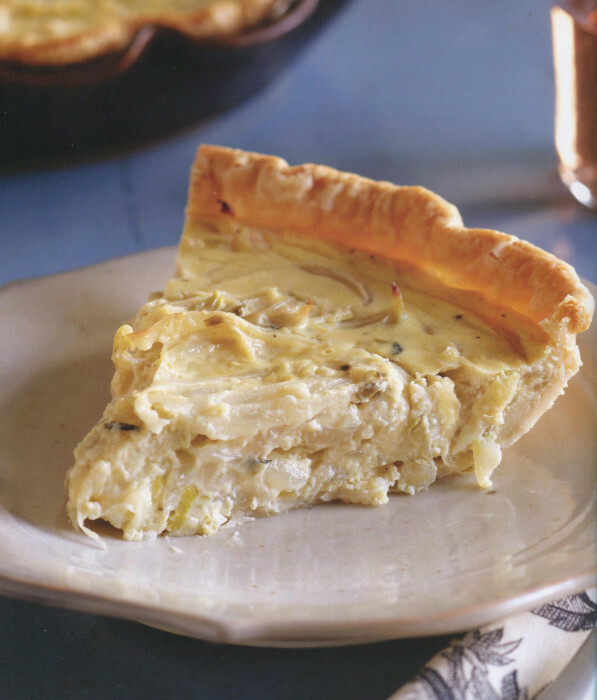 It’s a pie, not a tart, and in this particular recipe the onions are totally drowning in a custard of eggs and half-and-half. And, unlike many of the recipes for onion tart, there is no cheese here. Pure, soft custard only. Well, there is some onion and wine but every recipe deserves some of those. This pie is an excellent, and rich, accompaniment for proteins of all kinds: roast poultry, beef, veal, or pork. Go easy on the nutmeg, but do include it for a more complex flavor. To make this pie, you’ll need an unbaked pie shell of your choice. Set a sturdy rimmed baking sheet on middle oven shelf and preheat oven to 350°F. Melt the butter in very large heavy nonreactive skillet over low heat, add onions, scallions, nutmeg, and thyme, and cook slowly, stirring often, about 10 minutes until soft and golden but not brown. Add wine and flour, stirring to coat onions evenly. Remove from heat and cool 10 minutes. Meanwhile, vigorously whisk together eggs, half-and-half, salt, and pepper in large bowl. Fold in sautéed onion mixture and pour into pie shell. Center pie on hot baking sheet in oven, and bake 30 to 35 minutes until set like custard. Transfer pie to wire rack and cool 5 to 10 minutes before serving. The accompaniment I like best when the pie is served as the main course of a light lunch or supper? An oil-and-lemon-or-vinegar-dressed salad of mixed greens, some mild, some bitter (arugula, radicchio, nasturtium, dandelion, etc. ).